Long before there was the company and product Leadpages, there was another product that I purchased called LeadPlayer. It was a product developed by Clay (from Leadpages) and his lead developer, Simon Payne. It was the first product I purchased from those guys and I loved it because it made email gating (when it comes to videos) really easy. 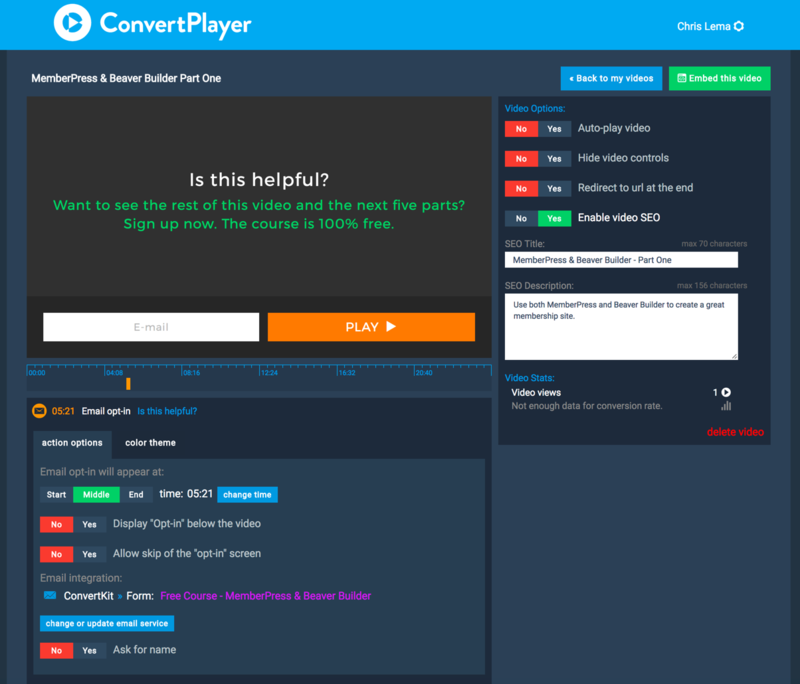 And now Simon has moved on from Leadpages and created a new solution for it called ConvertPlayer. What is email gating for videos? Email gating is a simple way to capture leads by putting a form (that captures emails) in front of valuable content. When you combine this lead generation strategy with video, it can be incredibly effective because it allows you to showcase part of a video and then make a request to trade a site visitor’s email for the remaining part of the video. Most of the time, people struggle with the third part, because while Wistia offers Turnstile, it isn’t always an inexpensive option. But when you bring these three things together, you end up with a way to deliver a great value proposition to site visitors. ConvertPlayer allows you to use videos (like this unlisted video on YouTube) that you have already created, and insert a form to collect emails. In this case, instead of picking “start” or “end,” I chose “middle” and could pick the exact moment when I want the form to appear. I also get to control the look and feel of the title, text, and form. And I can leave you watching the video and place the optin below the video, or like I did in my case, take over the entire screen. And I can even add a feature that let’s you skip my optin and continue on without the form. Of course, I don’t use that option. Single site owners can leverage this for $8/month, and they’ve created a WordPress plugin that does the integration for easy placement. But it works just as well without the plugin (like I’m doing here). There are several ways to leverage this lead generation strategy. Here are just a couple. If you’ve been providing a lot of non-gated content about your product, and finally want to show folks your product demo video, you might mid-roll gate the video as a way to evaluate interest before folks are ready to go deeper in the funnel towards a purchase. It’s a small trade rather than the larger purchase dynamic, but it still gets you warm leads. Imagine you’ve created a free video course. You can place a mid or post-video call to action (CTA) that captures email in order for people to get information on the remaining parts of the course. You’ll see that example below. Running an eCommerce site? Showcasing a lot of video related to your product? Why not use the post-video CTA to offer people a trade for a coupon, redeemable at a future date? And while these are just three examples, you could do so much more. But rather than tell you more about this product, let me just show it to you (for a free course I created for membership sites). You’ll have to wait until just after the 5 minute mark to see the form, but I think it’s placed at just the right moment to help you decide if you want more or not. Here’s a sample of a free 6-part video course on creating a membership site (using MemberPress and Beaver Builder). Note – by putting in your email, you’ll be put on my course list and I’ll send you the information on how to get access to all 6 videos in their entirety.